This sudden appearance of these meteors in 2011 was a surprise and astronomers ran simulations to match past displays and to see if any repeat encounters are in the offing. Calculations indicated that the Earth will again skim the debris field of the 1649 return on or near December 6, 2018. This display is not expected to be as strong as the 2011, which had an estimated zenith hourly rate of 50. Yet any sightings of these extremely slow meteors would be a treat and a link to past history. 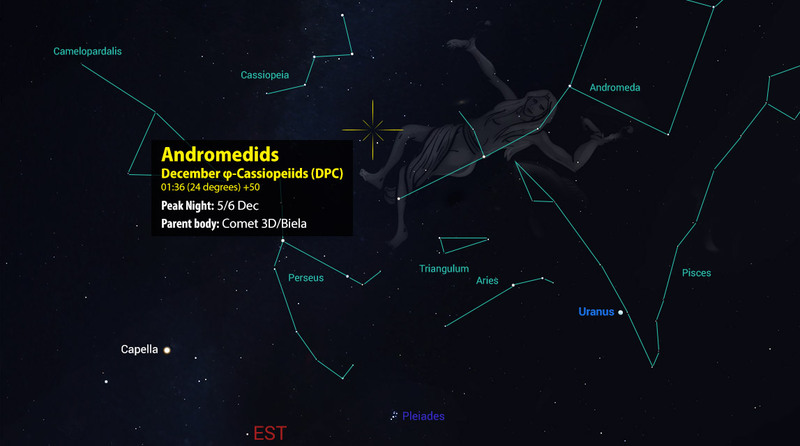 The expected radiant on the night of December 5/6 would be located near 01:36 (24 degrees) +50, which is located in extreme northern Andromeda, 2 degrees northwest of the 4th magnitude star known as Nembus (aka 51 Andromedae). This area of the sky is situated far enough away from the Taurid radiants that identification should be easy. 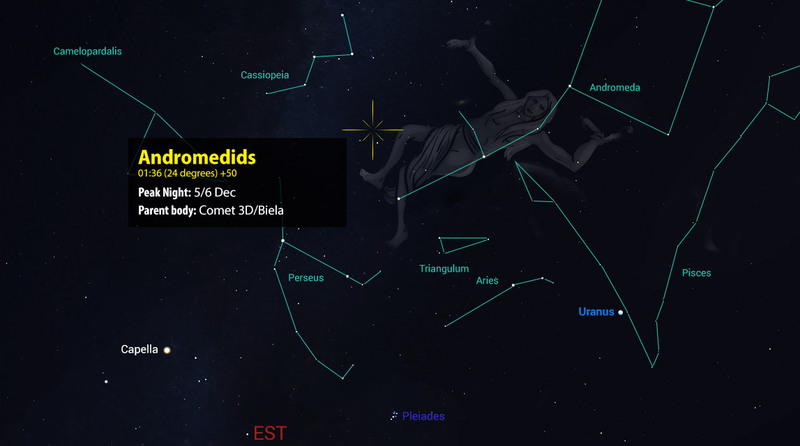 This area of the sky is well placed high in the northeastern sky as soon as it becomes dark in late November and early December. Luckily, the moon will be in the morning sky nearly all of this period allowing an unhindered view of possible activity. It is imperative that potential observers seek the darkest skies possible as most of this activity is expected to be faint. Radar installations such as the one in Canada can pick up meteors fainter than the eye can detect. Yet video cameras have been successful in capturing these meteors so this is encouraging for visual observers. Don’t stare directly at the radiant as shower members occurring there may be too short to see. Place the radiant area at one side of your field of view so that potential shower members can be easily trace back to the radiant. These meteors have been recently listed in the International Astronomical Union as the December phi Cassiopeiids (DPC) #446 with an activity period of November 28 to December 10. I would make it a point to view for these meteors during this entire period, but especially near December 6th. Negative reports are just as valuable as positive ones! A little history reveals this was the main radiant of the Andromedids before the breakup of Comet 3D/Biela in the 1840’s. 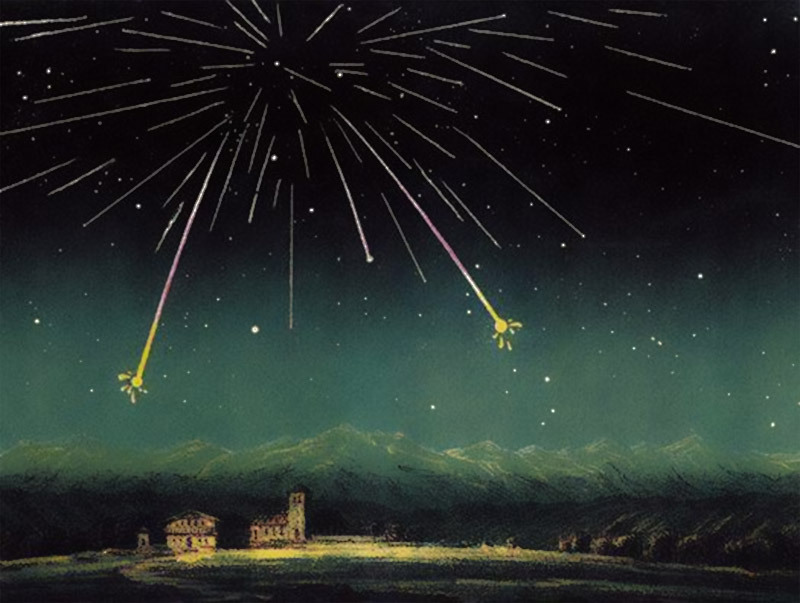 Subsequent displays including the great Andromedid storms in 1872 and 1885 were produced from a more southerly radiant near the Andromeda/Triangulum border. This radiant is still active today producing low rates between October 26 and November 17 each year. This is a view of the northern sky and the position of the radiant at 20:00 (8:00pm) local standard time on December 5, 2018 as seen from latitude 40N. Thank you for texting something I have been interested in for a long time. But I don’t want to join any group that would cost me money. Thank you. I’ve successfully observed Bielids in the past, around December 5 to 7, thinking that there may be meteoroids left behind in the original orbit. I seem to recall rates of 2 to 4 an hour, out of northern Andromeda. What I strongly believe were Bielid meteors were faint, white to orange red, and incredibly slow, like Draconids, the outburst of which I was lucky to observe in 1985, October. I’ll be looking!. 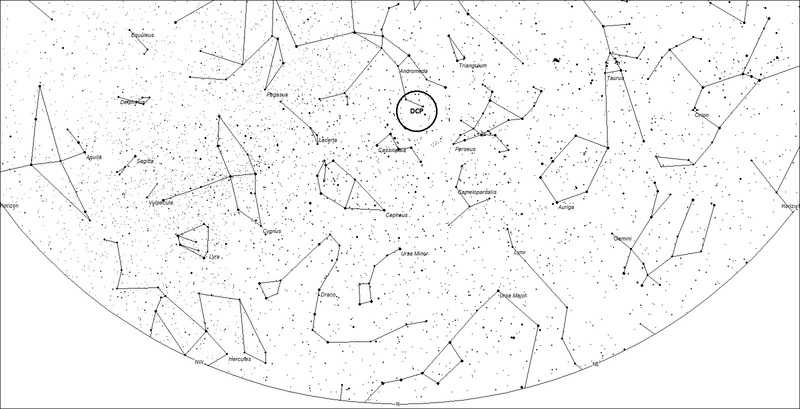 A brilliant white, very slow, poiny, smoky fireball I observed in early December 1965 may even have been a Bielid. I still recall this clearly! Your comments remind me of seeing my first “Bielid”. I cannot recall the exact date off the top of my head, but I do have it entered in my journal. I believe it occurred during November in the late 60’s. I was looking through my 2 1/2″ Sears refractor and just happened to look up and see a bright orange meteor shoot out of the Andromeda area heading straight up. As you said it was incredibly slow and extinguished shortly after reaching the zenith. I knew exactly what it was as I had read stories of the Andromedid outbursts in 1872 and 1885. This meteor was a member of the “outburst” (post breakup) Andromedids which are currently active in late October and early November. I hope to see my first “classical” Andromedid (pre-breakup) this upcoming week! I’m going to try this year. I think I saw one around the mid-eighties when I was on the campus of the University of Toledo in northern Ohio. Very slow, long, and a deep, almost dried blood red. Lights were on all over the place and still saw it, but couldn’t associate it with constellations because I couldn’t see any. Otherwise, like the Draconids, have never had the pleasure despite being a meteor observer off and on since 1966 (Perseids were great this year, 2018! ).